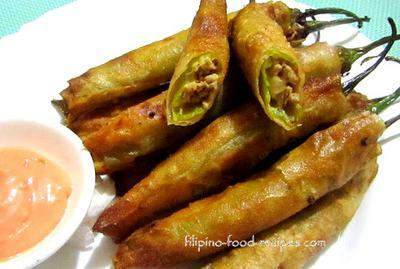 Dynamite Sticks are stuffed chili peppers wrapped in spring roll wrapper with the stem sticking out as a handle. Usual fillings are cheese and ground meat, and the seeds and ribs are removed to cut back on the heat of the peppers. I use the long chili pepper or Siling Pang-sigang, where its degree of heat varies from pepper to pepper. When I want to check the level of heat, I cut a little piece of the raw pepper and taste it as it is. Also, for this recipe, I try to pick peppers that are closely similar in thickness, even though not the same length. I could always cut the ends to make them about the same lengths. 1. Cut the peppers ends to make them uniform lengths, then for each one, slit one side and remove the seeds and the ribs or the white part, then wash, pat dry and set aside. 2. In a skillet, saute the onion, garlic in butter and add the pork and seasonings. 3. Add a cup of water and cook until the liquid is fully absorbed. 4. Remove from heat, let it cool down and drain any excess liquid. 5. Insert around 1 teaspoon of the meat and one slice of cheese for every pepper. 6. Wrap each one tightly in spring roll wrapper. 7. Deep fry until golden brown. 8. Serve with your favorite dipping sauce or a mix of Ketchup and mayonnaise.